ORDER NOW AND GET A FREE PAINTED SKETCH! "It's a meditative but also a dazzling emotional journey for the reader as well as Simon, a parable of finding oneself within what already exists but is not known, of seizing your identity through what came before you and your effort to connect the lines between yourself and everything else. A tapestry of jaw-dropping beauty." "A semi-autobiographical masterpiece...Pedrosa's art is outstanding, combining the warmth and vitality of sketchwork with an eye for detail and facial expressions. 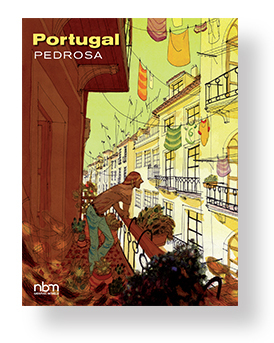 The book's palette of colors also helps to draw outsiders into the very personal experience of Portugal." "Digging into the past shows him how to move forward, and Pedrosa turns Simon's self-discovery into a beautiful journey through a foreign country full of wonders. There's remarkable precision in the artwork, with each location and character rendered in lush detail." "Expectations for this volume, already a best seller in France, will be high. Luckily, this masterpiece is actually even better than the hype." "A tour de force! Pedrosa's loose, expansive writing style is perfectly complemented by his lush, lightly lined drawings, in which people and their stories overlap each other with discursive enthusiasm. Everybody has a lot to say in this graphic novel whose gorgeous art is as full as its story." "I have to say that I love Portugal more than any comic I've read since Moon and Ba's Daytripper." "Pedrosa deftly narrates his return to his roots in a deeply compelling and warmly human way." "4 out of 5. I-N-C-R-E-D-I-B-L-E graphics! Intriguing story." "One of top ten graphic novels of 2017. As much a triumph of atmosphere as action. The book's artist as a young man may be disenchanted, but the dazzling, meditative panels are entirely enchanting." In an equinox, day is as long as night, as if the world found perfect equilibrium between shadow and light, a fleeting equilibrium, similar to the stakes of our human destinies. Segmented into four tableaux for four seasons, unrelated people of all social backgrounds seeking equilibrium cross paths with other solitudes, weaving in and out of one another's lives- all captivated and tormented by the enigmatic meaning of life. Every season has its visual identity and its individual voice, culminating in summer and, possibly, an answer. 'Equinoxes' is a unique ground-breaking work of rare intensity and narrative sensibility by a rising bestselling star of European comics. 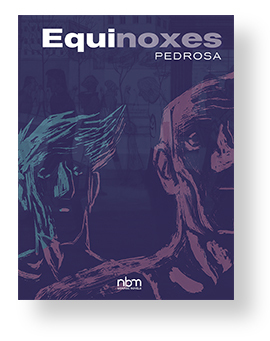 "Cyril Pedrosa's Equinoxes is an impressive feast of a book." PW has named this a top 10 for Fall '16. "Bowled away by this book. Majestic!" "Pedrosa keeps the book moving briskly thanks to his facility with dialogue, skill with visual pacing and genuine affection for his characters." "Thoughtful and well executed. The color work is exceptional." "A fine example of how graphic fiction can indeed be literature." "Ambitious and beautifully drawn. Worthy of recognition for comics as literature." "Quite simply put, Equinoxes may just be one of the most important books you read this year. It is that damn good." "With this graphic novel, the master cartoonist lays it all bare. Like an overstimulated genius infant still fresh and new. " "Each and every page of this pageant is worth lingering over: A lavish tribute to the power of sequential art. At its best—and it is frequently at its best—Pedrosa's work borders on magic."